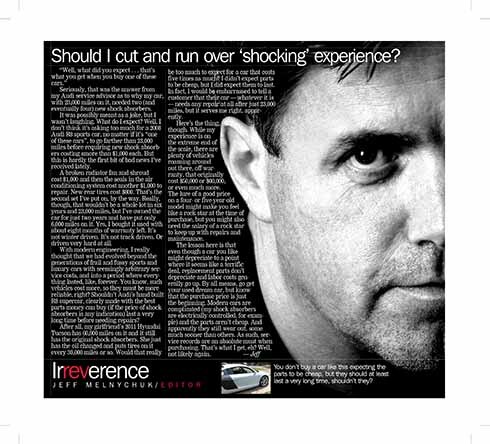 Should I cut and run over ‘shocking’ experience? Seriously, that was the answer from my Audi service adviser as to why my car, with 23,000 miles on it, needed two (and eventually four) new shock absorbers. It was possibly meant as a joke, but I wasn’t laughing. What do I expect? Well, I don’t think it’s asking too much for a 2008 Audi R8 sports car, no matter if it’s ‘one of these cars’, to go farther than 23,000 miles before requiring new shock absorbers costing smore than $1,000 each. But this is hardly the first bit of bad news I’ve received lately.